The Future Fisherman Foundation is taking dramatic steps to grow angling participation through a unique partnership with the U.S. Department of Justice (DOJ) and local Boys & Girls Clubs throughout the United States. 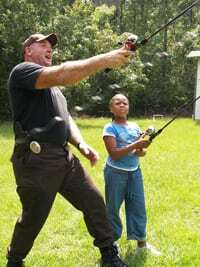 Under its agreement with DOJ, through the Law Enforcement and Youth Partnerships for Crime Prevention Initiative (LEYCP), the Foundation engages local law enforcement and local club leaders to work in tandem to teach angling skills to young people in participating Boys & Girls Clubs. Utilizing the Foundation’s Hooked on Fishing Not on Drugs® (HOFNOD) fishing education curriculum, youth have the chance to learn angling skills, reinforce personal development and positive life skills and to connect with nature. The Department of Justice, Office of Justice Programs, Bureau of Justice Assistance along with an array of national organization and law enforcement partners developed the Law Enforcement and Youth Partnerships for Crime Prevention Initiative to provide seed money to local organizations for innovative crime prevention programs. These programs focus on engaging youth in positive activities that collaborate with and support local law enforcement efforts to help prevent crime in America by strengthening relationships between youth and law enforcement. The Foundations’ involvement in the LEYCP initiativeprovides access and opportunities for children in urban areas that would otherwise not exist. Through this unique partnership, the Foundation is able to deliver important life lessons; necessary social development skills and to provide a meaningful introduction to the lifelong pursuit of the great American pastime of fishing. Connect with your local Boys & Girls Club. Support the efforts of the Future Fisherman Foundation. Help support our efforts by donating your time or resources or by making a contribution to help enable youth angling programs all across the country! Get Involved! Help to Ensure the Future of Fishing! “Play in nature, particularly during the critical period of middle childhood, appears to be an especially important time for developing the capacities for creativity, problem-solving, and emotional and intellectual development.” Stephen Kellert “Nature and Childhood Development 2005.